Ask them if you can have Collective contact them. Then, get a contact name, phone number and email address and send it our way. Why team up with Collective? • We are excellent at what we do. • We will follow up on any given referrals. • We’ve been designing websites and creative digital and print solutions for over 12 years. • We focus on making sure the website is focused on doing one job – converting users to customers. • The referred trusted you first and we want to maintain that. 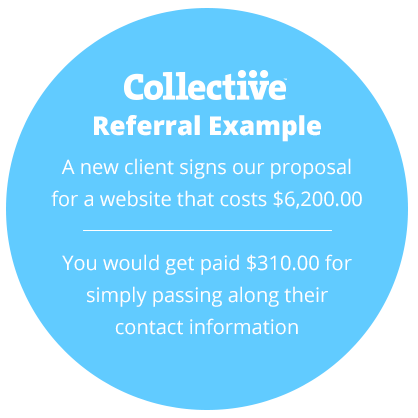 Please send referral contact information to: referrals@collectivedallas.com.